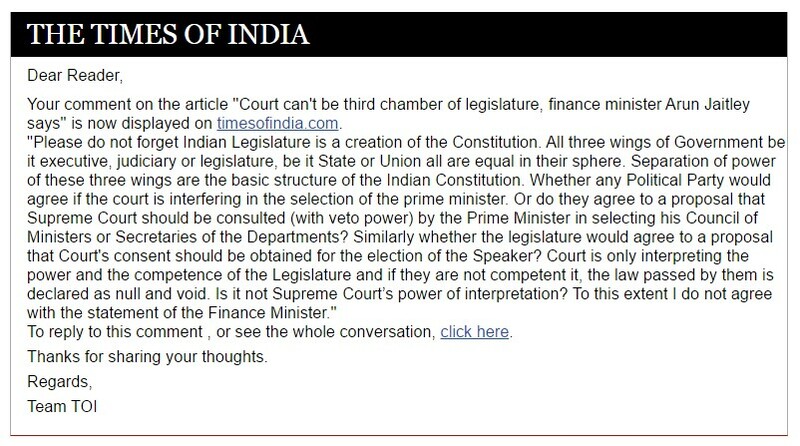 The proposal of the Government "The criteria for selection of judges to the higher judiciary should be spelt out and must be part of the memorandum of procedure and put up on the websites of the apex court and high courts to make the functioning of the Supreme Court's collegium system more transparent" is a welcome move. But this should also be applied to selection of candidates for election, appointment of Governors, appointments of heads of Constitutional bodies etc. so that people should know on what credentials they are being selected and no other better persons available in India among the over 120 crore people. WHETHER SUPREME COURT CONSENT SHOULD BE TAKEN BY THE PRIME MINISTER IN SELECTING HIS COUNCIL OF MINISTERS? 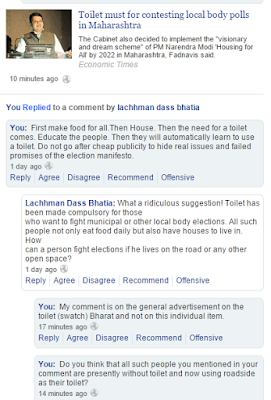 Please do not forget Indian Legislature is a creation of the Constitution. All three wings of Government be it executive, judiciary or legislature, be it State or Union all are equal in their sphere. Separation of power of these three wings are the basic structure of the Indian Constitution. Whether any Political Party would agree if the court is interfering in the selection of the prime minister. Or do they agree to a proposal that Supreme Court should be consulted (with veto power) by the Prime Minister in selecting his Council of Ministers or Secretaries of the Departments? Similarly whether the legislature would agree to a proposal that Court's consent should be obtained for the election of the Speaker? Court is only interpreting the power and the competence of the Legislature and if they are not competent it, the law passed by them is declared as null and void. 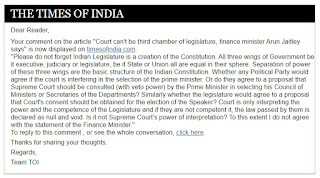 Is it not Supreme Court’s power of interpretation? To this extent I do not agree with the statement of the Finance Minister. 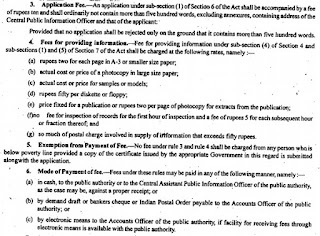 “(i) RTI application number, date and date of its receipt in the public authority. (ii) The name, designation, official telephone number and email ID of the CPIO. the relevant sections of the RTI Act should be clearly mentioned. whom the application is transferred should be given. Authority within 30 days of receipt of reply of CPIO. 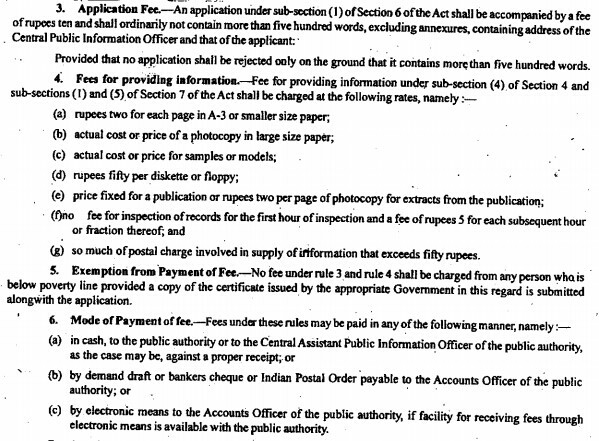 “True copy of the document/record supplied under RTI Act. It is also mentioned that, in case the documents to be certified and supplied is large in number, information on RTI application should be supplied by a designated PIO but the certification of the documents, if need be, could be done by another junior gazetted officer. There are newspaper reports that the Union Finance Minister sought Parliament's approval on Friday 31/07/2015 to increase the budget allocation for this fiscal year by about $4 billion, that is, about Rs 70,000 crore, of which about 50% is to be used as extra capital into Public Sector Banks struggling with bad loans (NPA). There are instances that some liquor companies float group companies to carry their logo on their products/services as surrogate advertisement since direct advertisement is not allowed in India for Alcohol products. Huge bad loans are from such companies where free advertisement is given to the parent company. Just imagine how much is to be paid for carrying a logo in a car participating in a car race or a cricket match. In short, benefit is to the parent company which runs in profit and the liability to such dummy companies which results in bad loans. Now Government of India is paying back these bad loans in disguise from the taxes like Excise Duty etc., collected indirectly even from the petty expenditure of the beggars on the street and Direct Taxes like Income Tax. Please also read my following 3 blogs on the subject which I had written in mid June 2015 and is valid even today: 1. FINANCE MINISTRY AWARD TO ERRING BANKS dated 14/06/2015 2. ROBBING THE POOR TO FEED THE RICH - THE GOVERNMENT WAY dated 18/06/2015, 3. MAHARASHTRA CHIEF MINISTER ASKS CRIMINAL PROCEEDINGS AGAINST ERRING BANKERS dated 19/06/2015. 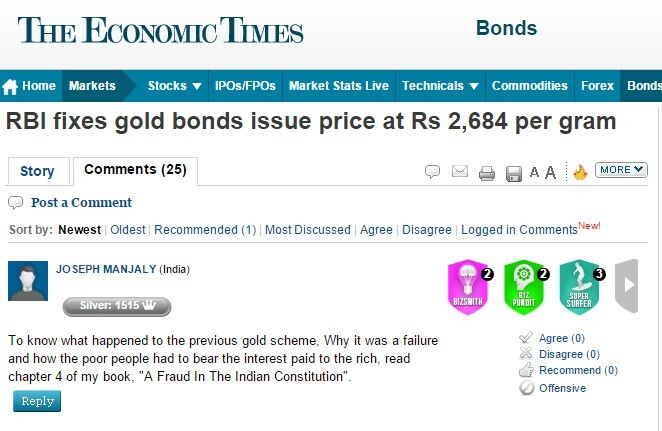 I had already written a book by name ‘A FRAUD IN THE INDIAN CONSTITUTION’ and published as an e-book (paper back is under printing) explaining how the Ministries in collusion with the Comptroller and Auditor General of India (CAG) is fooling the Parliament and thereby fooling the nation by accepting wrong audit objections by the ministry for remedial action and at the same time settling the genuine objections under the table (http://www.amazon.in/FRAUD-IN-THE-INDIAN-CONSTITUTION-ebook/dp/B00SQKTADY). In this book, I also dealt with in detail about this kind of casual type budgeting right from the lowest level of a section to the highest level Ministry. Now the funniest part of the Office Memorandum: In this monsoon session of the Parliament, Finance Minister already prepared to seek approval for a supplementary Grant to finance a package to the public sector banks floating on the Non-Performing Assets (NPA). For more details, refer my earlier two blogs namely, ‘ROBBING THE POOR TO FEED THE RICH - THE GOVERNMENT WAY’ dated 18/06/2015 and “FINANCE MINISTRY AWARD TO ERRING BANKS’ dated 14/06/2015. In this background, my first question is whether the burden of NPA is a spontaneous incident noticed by the Finance Ministry after the last Budget session of the Parliament which necessitated for supplementary grant in the monsoon Session? 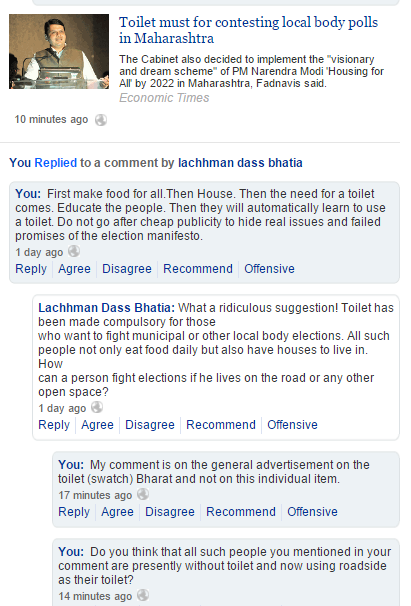 If not, why it was not included in the Budget? When the Minister itself does not honour the rules and regulations, how they can control the subordinates? This is only one instance. Almost all supplementary requests if analysed would come to this category. Second question is, how many M.P.s are utilizing their grants fully or at least substantially during the financial year so that it is not lapsed? IN CONTINUATION TO MY BLOG DATED 19/06/2015 UNDER THE CAPTION: ‘MAHARASHTRA CHIEF MINISTER ASKS CRIMINAL PROCEEDINGS AGAINST ERRING BANKERS’. 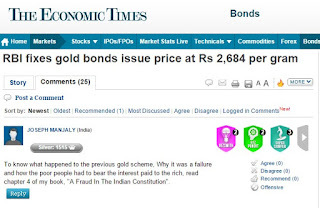 As reported in the DNA newspaper dated 10/07/2015, under the caption: ‘Banks to take possession of ...assets’, bankers are totally callous in nature to take action against the bigwig defaulters of loan repayment running into millions and billions on the simple theory that Government will recoup them from the public exchequer accumulated from beggars penny (Refer to my earlier blog of June under the caption ‘ROBBING THE POOR TO FEED THE RICH - THE GOVERNMENT WAY’ and ‘FINANCE MINISTRY AWARD TO ERRING BANKS’) to pay off the rich defaulters and to pay dividend to the shareholders. According to the report, a consortium of banks under SBI Cap would soon take over the custody of about 40 vehicles and a personal jet of ………. But the funny thing is that, the SBI Cap acted apparently after media reports claiming about airport operator Mumbai International Airport Limited (MIAL) selling these assets as junks to recover its due of about Rs53 crore from the now-defunct …. . According to the report, the defaulter owes over Rs 7,000 crore to bankers. However, in a recent newspaper report, the CENTRAL VIGILANCE COMMISSION advised his men to go slow on prosecuting the erring bankers. But think of a petty loan default from a common man due to oversight. Next day goons hired by the bankers would appear on his door steps or on the way while he was driving the car and take possession of the car. This has reference to the news item in DNA daily newspaper dated 04/07/2015 under the caption, "Follow BMC in ensuring info, chief secy told" quoting an instruction of the Maharashtra State Information Commission to the Chief Secretary of the State. But if MSIC’s own decisions are taken into consideration, I can tell with certainty that its own decisions are in the reverse gear taking the RTI Act backwards and MSIC’s outburst is only a crocodile tears. To cite my own example, in my case, the District Consumer Disputes Redressal Forum, Mumbai Suburban District made its decision in Marathi language. At same time I found that in other cases, decisions were made in English language. Therefore, I made an application to the SPIO of the Mumbai Suburban District Forum with a request to inform me “.. the distinguishing factor for selecting different language for different complaint may be furnished to the applicant”. In the reply, the SPIO replied quoting a rule that in my case decision was made in Marathi language in accordance with that rule. But the information regarding the rule under which decisions were made in English was not provided even after 1st appeal. Then only the distinguishing factor could be understood. Then I approached the MSIC with the following 2nd appeal request: “Rule under which Marathi Language was used in appellant’s case is furnished. Rule under which English Language was used in other cases is not furnished”. But the second appeal decision of the same Chief Information Commissioner mentioned above really surprised me. In his order dated 10/11/2014 he stated that my request for information is in the nature of a dispute and hence it is not covered under the definition of ‘Information’ under the RTI Act 2005. What is the dispute? Does knowing the distinguishing factor for selecting different languages for different cases by the same judicial authority is a dispute? Actually there is a dispute between myself and the SPIO that the information regarding using English Language in the decisions of the Forum is not furnished. For solving this dispute between myself and the SPIO, I approached the MSIC. Otherwise, why MSIC is there? Only for giving instructions to the Chief Secretary? I think that the MSIC is in a backlog clearance spree by quick disposal by dismissing the appeals without applying the mind by simply stating that it is not an information covered under the RTI Act2005 to discourage the applicants/appellants so that there would not be any huge backlog. The Supreme Court of India (SC) taught the National Consumer Dispute Redressal Commission (NCDRC) how to calculate Compensation in its Landmark Judgement of 1st July, 2015. Thereby SC enhanced the compensation of Rs. 5,00,000/- awarded by NCDRC to 1,38,00,000/- plus past medical expenses of Rs Rs.42,87,921/- (totalling to Rs.1,80,87,921/-). SC also spelt out in the judgement about the primary liability, vicarious liability, quantification of compensation, past medical expenses, future medical expenses, apportioning for inflation and apportionment of liability. SC was deciding two appeals one filed by the Appellant and another by the 1st Respondent (State) both against the decision of the NCDRC. On 30.8.1996, the appellant V. Krishankumar's wife was admitted in Government Hospital for Women and Children, Egmore, Chennai. She delivered a premature female baby weighed only 1250 grams in the 29th week of pregnancy ahead of the normal gestation period of about 38 to 40 weeks. The infant was in th incubator in intensive care unit for about 25 days. The mother and the baby were discharged on 23.9.1996. The crucial fact of the issue is, that the baby was administered 90-100% oxygen at the time of birth and underwent blood exchange transfusion a week after birth. The baby had apneic spells during the first 10 days of her life. She was under the care of Respondent No.3 - Neo-paediatrician and Chief of Neo Natology Unit of the Hospital and Respondent No.4 of the Neo Natology Unit of the Hospital. The Respondent No.2 is the Director of the Hospital, which is established and run by the Respondent No.1 – State of Tamil Nadu under the Department of Health. Both baby and the mother visited the hospital on 30.10.1996. Follow up treatment was administered at the home of the appellant by Respondent No.4, the Government Doctor during home visits. The baby was under his care from 4 weeks to 13 weeks of chronological age. The only advice given by Respondent No.4 was to keep the baby isolated and confined to the sterile room so that she could be protected from infection, but completely overlooked a well-known medical phenomenon that a premature baby who has been administered supplemental oxygen and has been given blood transfusion is prone to a higher risk of a disease known as the Retinopathy of Prematurity (ROP) which could in the normal course makes a child blind. The Respondent No.3, who was also a Government Doctor, checked up the baby at his private clinic, Chennai when the baby was 14-15 weeks of chronological age also did not suggest a check-up for ROP. It was also observed that ROP is a visually devastative disease that often can be treated successfully if it is diagnosed in time. The ROP was discovered when the appellant went to Mumbai for a personal matter and took his daughter to a paediatrician for giving DPT shots when she was 4½ months. In the circumstances, SC agreed with the findings of the NCDRC that the respondents were negligent in their duty and were deficient in their services in not screening the child between 2 to 4 weeks after birth when it is mandatory to do so and especially since the child was under their care. Thus, the negligence began under the supervision of the Hospital Respondent No.2. The Respondent Nos. 3 and 4, who checked the baby at his private clinic and at the appellant’s home, respectively, were also negligent in not advising screening for ROP. It was also noted that Respondent Nos. 3 and 4 carried on their own private practice while being in the employment of Respondent No. 2, which was a violation of their terms of service. First of all the SC quantified Rs.42,87,921/- actual cost incurred by the Appellant and his family. Accordingly it directed that the above amount shall be paid by the Respondent Nos.1 to 4. The next question that was considered by the SC is the compensation which the respondents are liable to pay for their negligence and deficiency in service by which the child has been rendered blind for life. For awarding compensation the principle relied by the SC is restitutio in integrum. The said principle provides that a person entitled to damages should, as nearly as possible, get that sum of money which would put him in the same position as he would have been if he had not sustained the wrong. In other words, the aggrieved person should get that sum of money, which would put him in the same position if he had not sustained the wrong, i.e., compensating the aggrieved person for the financial loss suffered. For the purpose of calculating compensation, the SC considered various ingredients namely, Past Medical Expenses, Future Medical Expenses, Apportioning For Inflation in addition to the normal calculation. As a result, against the Rs. 5,00,000/- compensation awarded by the NCDRC, what is quantified by the SC is Rs.1,38,00,000/- and directed to be paid, in the form of a Fixed Deposit, in the name of the child. The next issue considered by the SC is the Apportionment of Liability. It was also noted by the SC that the compensation awarded by the NCDRC was directed to be paid only by Respondent Nos. 1 and 3 i.e. the State of Tamil Nadu and Neo-pediatrician, Government Hospital for Women & Children, Chennai. However, no reason was assigned by the Forum for relieving Respondent Nos.2 and 4. who also treated the child during the course of his visits to the house of the appellant. SC also considered the settled law that the hospital is vicariously liable for the acts of its doctors. By the same measure, it is also not possible to absolve Respondent No. 1, the State of Tamil Nadu, which establishes and administers such hospitals through its Department of Health, from its liability. After considering all these issues, SC apportioned the liability of Rs. 1,38,00,000/- and Rs.42,87,921/-among all the 4 respondents, in various terms and conditions with permission to adjust any payment already paid. As a result, Civil Appeal No. 8065 of 2009 was allowed and and Civil Appeal No. 5402 of 2010 was dismissed. INEFFICIENCY (OR NEGATIVE EFFICIENCY IN SUPPRESSING THE CASE?) OF THE INVESTIGATORS AND THE PUBLIC PROSECUTOR SAVED CULPRITS FROM DEATH SENTENCE. This is a Supreme Court of India Judgement dated 01/07/2015 in which a barbaric and cold blooded murder accused were set free only on the ground of doubt on account of the inefficiency (or negative efficiency in suppressing the case?) of the investigators and the public prosecutor to bring the facts on record. However, unlike in the famous Aarushi Murder Case of New Delhi, there is no order for reinvestigation to find out who are the real accused. So the real culprits are roaming free now. It is nothing less than a Hollywood film story. The murder according to the prosecution witness was like this: On the fateful day of murder, a small boy aged about 8 years, was playing near Ambedkar Park (Uttar Pradesh). At about 10 a.m. the main accused took the boy to her baithak, which was seen by villagers namely the witness and another villager. At that time three accused sons of the main accused who along with the main accused were sitting in the Verandah. They went inside taking the boy along with them and did not come out for about half an hour. It was alleged that the main accused and her sons then came out with a “thaal” filled with articles of worship (pooja samagri) and went towards Chamunda Math for worship. Since witness and the other villager did not see the boy coming out, they suspected some foul play and soon after main accused and her sons had left for Chamunda Math, they went inside the baithak. As they entered, they saw the dead body of the boy lying in a pool of blood with nostrils and ears cut. They raised hue and cry, which attracted number of villagers. When the villagers saw the body of the boy, the situation took an ugly turn and there was a complete chaos. The people then went to the Math and assaulted the main accused and her sons. The police thereafter arrived in the village and Inquest Panchanama was conducted between 2:30 p.m. to 4:00 p.m. Around this time, the main accused and her sons were arrested at about 3:30 p.m. After the inquest, the body of the boy was sent for post mortem. Dr. R. K. conducted post mortem at 4:30 p.m. According to him, the cause of death was asphyxia resulting from throttling. It was also stated that some of the injuries were possible by a sharp cutting weapon. In the meantime, all the accused were arrested and on personal search of accused, blood stained dharati or sickle was recovered. After completing the investigation, charge sheet was filed against them and they were tried in the court of Additional Sessions Judge (Fast Track Court), Bulandshahar. The trial Court after considering the material on record, found the eye witness account coming from the witness to be trustworthy and that the case was fully established against the main accused and her sons. After considering the submissions advanced on behalf of the prosecution and the accused on the issue of punishment, the Court by its further order found the case to be rarest of rare warranting extreme punishment of death penalty. Therefore, death penalty was imposed on the accused, subject to confirmation by the High Court. The matter reached the High Court. By its judgment the High Court acquitted the accused of the charges leveled against them. The High Court accepted that the prosecution had proved that the boy was done to death at about 10 a.m. on 24.02.2006 in the baithak owned by the accused. It however took the view that the prosecution had failed to prove the complicity of the accused in the offence. It observed that looking to its contents and language, the First Information Report did not appear to be a genuine document and the scribe was also not examined. According to the High Court it did not stand to reason that large number of villagers had apprehended the accused and given them thrashing and yet allowed them to escape and that the main accused, a lady of 58 years, would so succeed in running away. It also found force in the contention of the respondents that the place of occurrence was an open place and accessible to all. Then the State being aggrieved, filed appeal before the SC challenging the order of acquittal passed by the H C.
According to the Supreme Court, the evidence of the sole witness needs to be considered with caution and after testing it against other material. Further, such evidence must inspire confidence and ought to be beyond suspicion. So SC examined the testimony of the sole witness in the context of the material on record. It took note that apart from his own testimony nothing has been placed on record by the prosecution which could lend corroboration to his own presence and the content of his version. First, no reason has been given why the witness and another villager were sitting on the bench outside the clinic of the doctor. Neither the doctor nor the other villager were examined. Beyond the testimony of the witness himself, there is nothing to indicate whether the witness was actually there at the relevant time or not. Secondly, the place from where he allegedly witnessed the occurrence was not a natural place where either the witness resides or carries on any vocation. The reason for his being there was not placed on record. Again the reason for his continuing to be there for 20-25 minutes was also not spelt out. Thirdly, none from the house of the boy was examined nor throw any light as to when the boy left the house and in whose company he was playing. The prosecution also did not give any names of those children nor had anybody else been examined to say that they had seen the children playing at the place in question. There was nothing on record which could corroborate that the boy was actually present with other children. Fourthly, there was nothing to indicate how far the house of the boy was and whether that was the normal place where the boy would always be playing. Lastly, if the incident created chaos in the village and the villagers went and thrashed, there was no reason why none of them was examined. As regards his version about the incident, the manner in which it was occurred, the involvement of the accused - whether all or some of them, there is nothing on record which could possibly allow the Court to test the authenticity of the version of the sole witness. To the Court, it was doubtful whether the witness could be called a natural and truthful witness and whether he could be completely relied upon. The movements of the boy were also not established to show that he was actually there as suggested by the witness. Another point noted by the SC is that the accused were apprehended on the same day when one of them was allegedly found to be in possession of blood stained dharati or sickle. According to the prosecution the weapon was blood stained and was kept in the folds of dhoti. However, no such blood stained dhoti was recovered. For that matter no blood stained clothes were recovered from any of the accused though they were supposed to be committed the crime which left body of the boy in a pool of blood. Even though the blood stains found on the cemented portion of the Chamunda Math, were quite disintegrated as per FSL examination. In the circumstances explained and particularly when the SC was considering an appeal against acquittal, according to the SC, interference in this case would be justified and called for, only if they find that the testimony of the sole witness of such character that it could be fully relied upon. In this case, where the accused were being tried for an offence punishable with capital punishment, the scrutiny needs to be stricter. In the view the SC, material on record definitely falls short and the accused were entitled to the ‘benefit of doubt’. The SC therefore, affirmed the view taken by the High Court and dismissed the State appeal. The appeal preferred by the Complainant was also dismissed.